City DPRD held a plenary meeting with the agenda of reading Sandiaga Uno's resignation speech as Jakarta Deputy Governor.
" 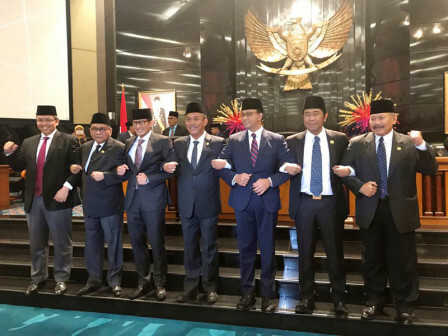 I declare that I have officially stopped as Jakarta Deputy Governor"
The meeting was led by City DPRD Chairman, Prasetio Edi Marsudi along with four vice chairmen, namely Mohamad Taufik, Abraham Lunggan, Ferrial Sofyan, and Triwisaksana. In that occasion, Sandi expressed his appreciation and apology to the DPRD members who were fully committed to working well together as long as he carried out his duties and responsibilities as deputy governor. "I declare that I have officially stopped as Jakarta Deputy Governor," he expressed, at City Council building, Monday (8/27). Jakarta Governor, Anies Baswedan responded to the official announcement of Sandi's resignation. "Today Mr. Sandi has officially given a statement stopping as deputy governor," he uttered. He also assured that there was no change in the work program, even though Sandi had officially announced his resignation through a plenary meeting. "We all in Jakarta will continue to carry out our plans and commitments," he said.